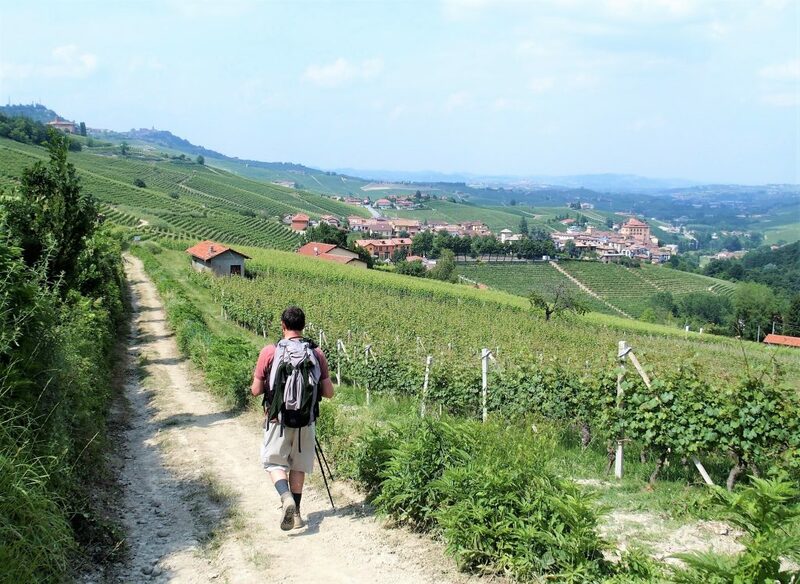 Starting and finishing in beautiful Alba, this circular walk explores the sweet rolling hills of the Langhe, one of Italy’s premier wine and food regions, which is scattered with villages and castles that date from Roman times and which is crisscrossed with trails that have been walked for centuries. But Alba and the Langhe are more than this. A neighbour of Bra (the home of the Slow Food Association) Alba is also one of Italy’s gastronomic capitals, well-known for its cheeses, meats, Ferrero chocolates and nougat but particularly famous for its white truffles, found in the surrounding poplar and oak forests, which fill the medieval streets of the towns with their pungent aroma throughout October and November. An extensive network of well-marked walking trails connect the charming villages, castles and towns of the district, passing over undulating hills, through vineyards, hazelnut orchard (Alba is also the home of Nutella) and forests, providing the perfect way to explore these hidden gems of Piedmont. This eight day loop takes you right through the heart of the Langhe hills. Starting and finishing in Alba, the first two days’ walking take you through the sweet rolling hills of the Barolo vineyards (‘the king of wines and wine of kings’) with spectacular views to the distant Alps in the north; the second two days take you through a slightly ‘wilder’ part of the district, leaving the vineyards behind and passing through forests and hazelnut orchards; the last two days bring back to Alba, returning via the undulating wine hills around Barbaresco. Along the way, you’ll visit some of the prettiest towns in Italy, as well as eating some very fine food! The walks: The trails are well-marked and generally follow unsealed country roads and lanes that take you over rolling hills often through vineyards and orchards regularly passing through towns and villages. There are the occasional rougher sections and a bit of asphalt walking into and out of the larger towns as well. As each day’s walk is between 12 and 18 kilometres and there are some long steep hills, we have classified this as a Grade 4 walk however, please note that all the walks can be shortened on request. The accommodation: Alba and the Langhe have a long history of hospitality and offer a range of very comfortable and welcoming accommodation. During the walk you will stay in a variety of accommodation including 4-star hotels (in Alba on Days 1 and 7 and on Day 5); an ex-castle/vineyard which once belonged to the king of Italy (Day 2); a lovely small hotel in the heart of the prettiest village in the district (Day 6) and a bed and breakfast/trattoria in a small hilltop village that has been in the same family for 4 generations (Day 4). All the accommodation has ensuite services. See the itinerary for details. 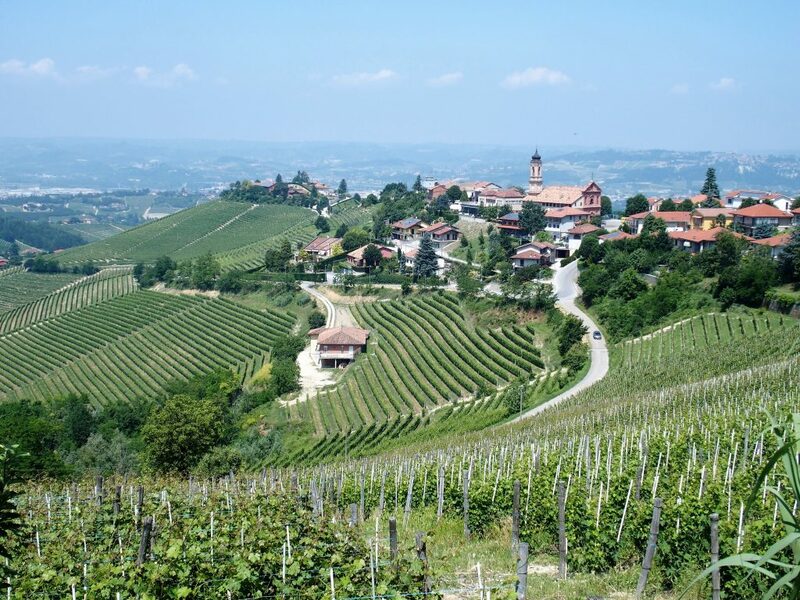 The food: Alba and the Langhe is one of Italy’s gastronomic and wine capitals so you will eat and drink very well during this tour (just as well there are some long walks!). According to Pliny the Elder and Strabo, this area was producing fine wines in Roman times. Its modern manifestation started in the mid-1800s with the introduction of production techniques from nearby France. Big, bold Barolo, the flagship wine, is recognised as one of the finest reds in Europe. The area is also famous for its food: the white truffles; cheeses like toma and castelmagno; Carru beef and traditional dishes such as agnolotti (local ravioli); tajarin (‘angel hair’ pasta usually served with truffles or porcini mushrooms); bagna caoda (boiled meats); vitello tonnato; brasato al Barolo (beef stewed in Barolo); coniglio con pepperoni (rabbit slow cooked in white wine with bell peppers) and bonet (a rich chocolate pudding). owned by the king of Italy. 4 hrs 14 kms. 3-star hotel on the main piazza. 3.5 hrs 13 kms. village, with a famous restaurant.. 18.5 kms. 5.5 hrs (please note, this walk can be shortened). Alba. 11.5 kms 3 hrs.